Carnival Funfairs provides total funfair and attraction solutions for event and corporate hire, providing quality bespoke solutions to suit varying themes, applications and budgets. These could be anything from business socials to charity events and summer balls. Carnival Funfairs also provide rides and attractions for many leading festivals in London as well as festivals in the South East of England. If you are planning an event, contact us. Primarily based in the South-East of England and serving the communities around London and the Home Counties, Carnival Funfairs have developed and displayed a quality of service that has lifted us to high critical acclaim and opened doors to numerous national and global opportunities. The strength of our name has allowed us to work with clientele such as British Airways, BBC, ITV and McDonalds on a regular basis, . putting Carnival Funfairs forward to plan and co-ordinate the Millennium Celebrations event in London in 1999 and since then to run major festivals in the centre of London every Christmas and New Year. The experience of Carnival Funfairs will show that your event can not only be planned to perfection but executed to the letter, taking care of every last detail. So why not contact Carnival Funfairs today and we can set up the greatest funfair event for you. Carnival Funfairs provides equipment and attractions as enhancements to existing event programmes, so, if you are looking to spice up that dinner or company ball, we have the ideas and expertise to meet your needs. We offer a complete service for corporate family fun days, providing the full range of rides, games, entertainers and catering to create the perfect day for young and old alike. We can help you find a suitable venue, look at the best way to maximise your budget, design and develop original event themes, organise your dance floor and scenery, assist in menu planning or co-ordinate entertainment schedules. 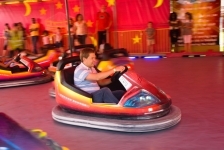 Rides vary greatly across the showground industry in both quality and capacity. We pride ourselves in our ability to provide the most competitive quotation that will meet the needs of your event and give your guests superb quality and value for money. These can be themed to your event and branded to your corporate identity. Our extensive worldwide contacts allow us to find THE location for you, UK or Worldwide we can organise exactly what you require.